Web real-time communication (WebRTC) is a web-based open source application supporting browser to browser real-time communication. It is an open source application programming interface (API) originated by the World Wide Web Consortium (W3C). WebRTC is compatible with HTML, TCP/IP, and HTTP protocols and uses multiple codecs for smooth transfer of voice, video, and data. At present, Google Chrome, Mozilla Firefox, Opera, and Microsoft IE support WebRTC communication. Global demand for WebRTC is expected to increase largely due to a rise in its application in end-use sectors such as telecom, IT, e-commerce, and others. The market is expected to see substantial revenue realization in the coming years. It is expected to grow at a gentler rate till 2021 due to reluctance from end-users for the adoption/implementation of WebRTC. WebRTC provides a time-efficient, easily accessible, and encrypted commercial telephony system. It is an open source API and can be easily accessed by application developers. This has led to significant adoption of WebRTC in developing communication solutions at a lower cost compared to traditional systems. WebRTC does not depend on the platform and device on which it is integrated, which is anticipated to attract global customers. In recent years, there has been an increase in the number of WebRTC users in the mobile application. For example, Snapchat (which just passed 60 million daily active users) uses WebRTC to power its video calling feature. It has no Web app for its main features. The WebRTC market is expected to be driven by demand for real-time communication applications. Real-time communications (RTC) defines methods for delivering interactive voice, video, and data on demand real-time. It provides the functions of both data communications and telecommunications in new contexts and platforms, of which mobile is becoming the predominant mode. In recent years, real-time Internet applications have been taken into consideration in order to provide quality of service (QoS) requirements. For real-time media, application designers are mainly concerned with temporal properties such as jitter, delay, bandwidth, and synchronization and reliability properties such as ordered delivery, error-free delivery, and fairness. In order to achieve such efficiency, industries across the globe are focusing on introducing real-time communication applications that can provide multiple advantages such as network reliability, security, efficiency, timeliness, and peer-to peer. Additionally, a rise in security budgets is driving the WebRTC market. Almost all industry verticals in the modern age require computers and the Internet to execute their work. Increase in the use of the worldwide web opens leads to data breaches and attracts cyberattacks on end-users. With high internet penetration in recent times, there has been a rise in data and identity theft and the use of ransomware. A major restraint of the WebRTC market is interoperability challenges and disruptive competition. Nevertheless, increase in demand for cloud telephony is anticipated to offer opportunities to the WebRTC market. Based on solution, the WebRTC market has been categorized into voice, video, and data sharing. In terms of platform provider, the WebRTC market has been classified into browser platform provider, mobile platform provider, and unified communication platform provider. The unified communication segment is estimated to expand at an exponential pace during the forecast period, owing to the integration of WebRTC technology with traditional telephony network. End-use industries adopt unified communications in order to have real- time conversations with others using mobile phones or computers. In terms of end-use industry, the WebRTC market can be segmented into telecommunications, IT, health care, e-commerce, education, media & entertainment, BFSI, and others. 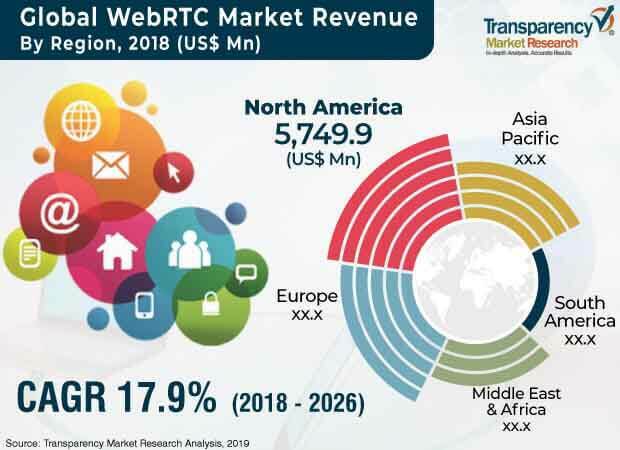 Major players operating in the WebRTC market include Acano Ltd., Google Incorporation, TokBox, Twilio, Avaya, Inc., Cafex Communications Inc., Citrix Systems Inc., Dialogic Corporation, Frozen Mountain, Genband US LLC, Oracle Corporation, Quobis Networks, S.L, Sinch AB, and TeleStax, Inc.. This report provides an analysis of the global WebRTC market for the period from 2016 to 2026, wherein the period from 2018 to 2026 is the forecast period and 2017 is the base year. Data for 2016 is provided as historical information. The report covers all the major trends and technologies that play a major role in the growth of the WebRTC market over the forecast period. It also highlights various drivers, restraints, and opportunities expected to influence the market’s growth during this period. The study provides a holistic perspective of the growth of the WebRTC market throughout the forecast period in terms of revenue estimates (in US$ Mn), across Asia Pacific (Asia Pacific), South America (SA), North America, Europe, and Middle East & Africa (Middle East & Africa). Web real-time communication (WebRTC) is a web-based open source application supporting browser to browser real-time communication. It is an open source application programming interface (API) originated by the World Wide Web Consortium (W3C). The application of WebRTC has increased remarkably in both telecom and unified communication applications and is expected to continue expanding in the coming years, stimulating the market to grow further. Over the next few years, the demand for WebRTC is expected to rise significantly among end-users, owing to its open source nature and high compatibility with multiple devices, which is likely to augment the market in the near future. Voice, video, and data sharing are key WebRTC solutions provided by market players across the world. The demand for video WebRTC solutions is higher than other types of solutions. Based on solution, the WebRTC market has been categorized into voice, video, and data sharing. In terms of platform provider, the WebRTC market has been classified into browser platform provider, mobile platform provider, and unified communication platform provider. The unified communication segment is estimated to expand at a rapid pace during the forecast period, owing to the integration of WebRTC technology with the traditional telephony network. End-use industries adopt unified communications in order to have real- time conversations with others using mobile phones or computers. In terms of end-use industry, the webRTC market can be segmented into the telecommunications, IT, health care, e-commerce, education, media & entertainment, BFSI, and others. In terms of country, the market in North America has been divided into the U.S., Canada, and Rest of North America. Similarly, the market in Europe has been divided into Germany, the U.K., France, and the Rest of Europe. The market in Asia Pacific has been segmented into China, Japan, India, and the Rest of Asia Pacific. Middle East & Africa covers the GCC countries, South Africa, and Rest of Middle East & Africa. Similarly, South America includes Brazil and the Rest of South America. The report also includes competitive profiling of major players operating in the WebRTC market. Important business strategies adopted by key players, their market positioning, and recent developments have also been identified in the research report. The major players in the WebRTC market include Acano Ltd., Google Incorporation, TokBox, Twilio, Avaya, Inc., Cafex Communications Inc., Citrix Systems Inc., Dialogic Corporation, Frozen Mountain, Genband US LLC, Oracle Corporation, Quobis Networks, S.L, and Sinch AB, TeleStax, Inc..